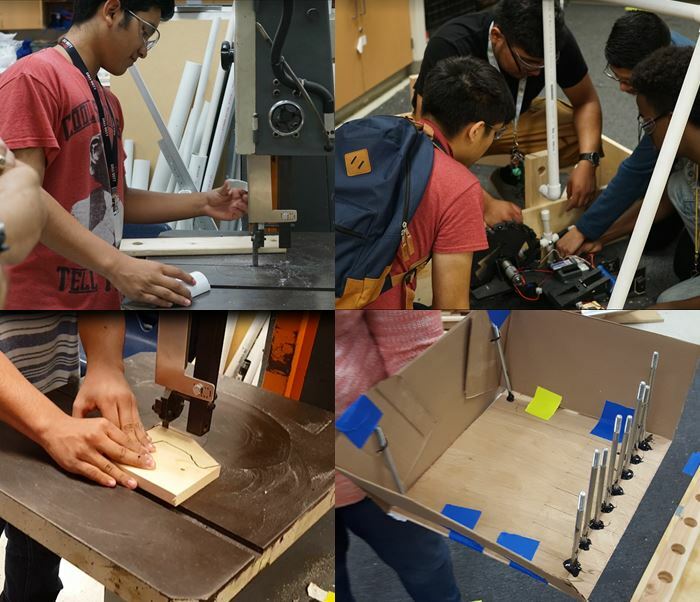 As explained in earlier posts, the first three weeks involved a large amount of new student training, cardboard prototypes, idea exploration, and strategy discussion. As we moved into Week 4, we were fairly certain of our strategic direction… had a broad idea of what could be accomplished… but hadn’t … you know… built much of the robot. Additionally, we made the same mistake we did last year and didn’t remember the notebook was due on demo day until today, giving us 1 week to complete it instead of 2. Fortunately, we had already planned to move to a 4 day per week schedule in Weeks 4 through 6, and we were able to make up a huge amount of ground. The principle focus was in turning ideas and concepts into testable prototypes (built of more substantial material), assigning clear owners/actions for key deliverables (robot CAD, marketing presentation, notebook, etc), and quickly validating assumptions. We advanced a few key prototypes, both pictured and not pictured. Our seed hopper design looks very promising, but little work had been done to integrate it into the robot. In the upper left picture, Kyle is working on a funnel of sorts to align the seed hopper to the silo. Additionally, we came up with a clever design of two pegs (spaced appropriately high and apart from each other), such that driving by the water valve can advance it 180 degrees. This was successfully installed and tested on last year’s robot to prove the concept (upper right picture). We continued development of the “claw” end effector (lower left), with plans to actuate it via a servo motor. However, continued discussion of gameplay as well as driving last year’s robot around reminds us that alignment to the game pieces can take quite a bit of time. Even with a solid claw design, we felt we needed to advance another prototype concept, namely a “bucket” that requires less alignment, or ideally can remove multiple game pieces in a single action (lower right). Also, unpictured, we used our gantry mill to cut out some basic gears from wood as a proof of concept. We also constructed a basic tower and arm, powered by motor that was directly coupled to a 1/2″ aluminum rod. This process led to us training 6-8 students on basic drill, drill press, and miter saw usage that had missed prior lessons. We also began running time trials using last year’s robot, to get a better feeling for what “ideal” game play looked like, and to refine estimates on how many game pieces we would be able to score. On the right, the seed magazine (with a zig-zag path internal to hold seeds) was fitted with a guide and tested on the silo. 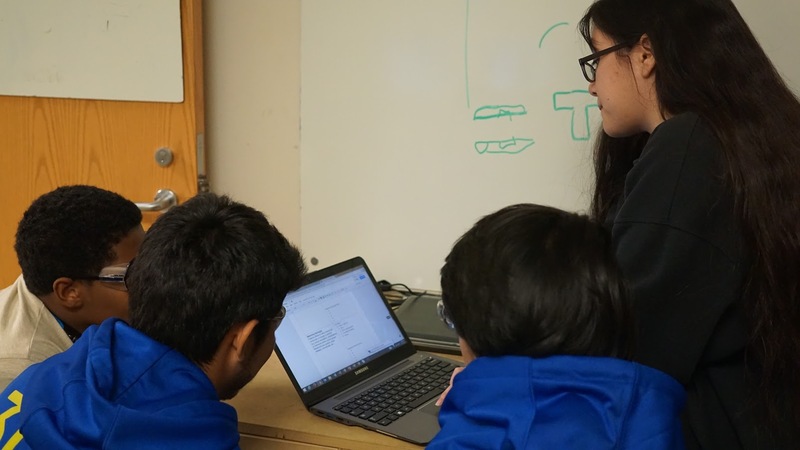 While we have been documenting our progress throughout the build season (mostly via pictures & video), the students had not yet begun to convert all of the content into the required deliverables. Champions were assigned to cover the three major deliverables (notebook, marketing presentation, and booth) and they were given authority to assign tasks as necessary to accomplish their goals. Our team is fortunate to have built a 4’x8′ gantry mill, that is capable of cutting wood/plastic/aluminum at tolerances sufficient for almost all parts in BEST and FRC. However, this does require us to have computer models of every part we intend to construct. On the good side, once we have a model, we can create extremely repeatable parts that fit together “just right”, making assembly and subsequent design iterations go very quickly. Additionally, it allows us to teach CAD/CAM, which are valuable skills in the industry. On the other hand, the process of developing the models for the first time can be quite slow, especially for students new to CAD. While all the other work was going on for Week 2/3/4, several students focused on CAD, creating custom parts and importing existing models. They started with the base (pictured left). Without any bumps or ramps on the field, we are hoping the small motor and small wheel combination will prove sufficiently powerful to drive the robot. Additionally, as the bucket prototype was developed early in the week, the CAD team decided to iterate on it, knowing the claw prototype was simple enough to be tested in parallel. The design incorporates wooden tines on a bar that can be rotated by dual servos. This allows a little more reach, as well as the ability to vary the angle of approach to the game pieces.